Discussion in 'ESET NOD32 Antivirus' started by Marcos, May 18, 2012. I am happy to announce the availability of the long-anticipated ESET Rogue Application Remover intended for detecting and removing rogue applications as well as reverting changes made by the rogue applications to the registry. By design, ERAR focuses mostly on rogue applications that affect the operating system in a negative way and that are difficult to remove by our products. In no way should it be considered a substitute for running a scan with our products or ESET Online Scanner. ERAR must be run with elevated administrator rights either in normal or safe mode. Internet connection is recommended not only for better detection efficiency and accuracy but also for automatic submission of detected files to ESET's viruslab when approved by the user. ERAR supports restoration of quarantined objects using the /r switch. For a complete list of supported options, run it with the /? switch. Feel free to share your feedback in this thread. I am happy to say I have no rogue. ERAR is very quick through all the phases. Tried ERA Remover 64 bit. As stated,it scanned very quickly. Will try this tools capability with some Rogue malware one of these days. Just to get an idea of how it works in action. Very fast on a clean machine. I am going to to test this next time one of my customers gets infected then I will report back. Comments and feedback have been solicited. That is excellent news Marcos . I will make that link available at my forum . ok...i found a problem..how can it "fix" my registry..?without my authorization. and there is no "undo" changes..
for example it reset the "change the way security center alerts me"
Hello, does it detect all rogue samples that ESET Smart Security can detect? Oops it detected and killed MCShield. It didn't delete the file automatically and asked me before removing its registry entries and files. I wish it to ask for every action. If I a not wrong ERA Remover do not use any database, just use heuristics. Where should we submit false positives? This way? These files are benign and thus are not supposed to be removed by ERAR (ESET products do not detect such benign files either). By design, ERAR focuses mostly on rogue applications that affect the operating system in a negative way and that are difficult to remove by our products. In no way should it be considered a substitute for running a scan with our products or ESET Online Scanner. I ran the scan in x86 Win7 Home Basic. 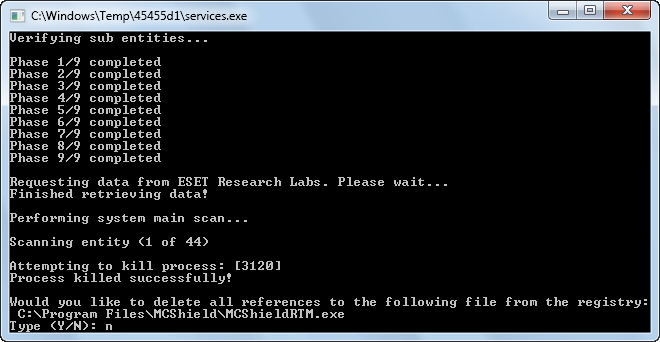 It killed MCShield process and during full scan detected its files in 32 bit Windows 7 and 64 bit Windows 7 that is dual booted in the same machine and also have MCShield installed. Ok I will try scanning again. ERAR detection rules are being adjusted according to the information gathered from submitted logs to make ERAR more accurate with minimum false positives. I'll keep you updated and let you know when it's available for download. ERAR has been updated to v. 1.0.1.1b. Detection rules have been adjusted according to the feedback we've gathered in the mean time. Whilst I think that innovation is necessary for an anti-virus product to continue to succeed, the growing number of separate programs that Eset offer should be integrated in the engine of the core Eset products. I don't want to have to download a separate, specific virus removal tool or find, update and run a "Rogue Application Remover". 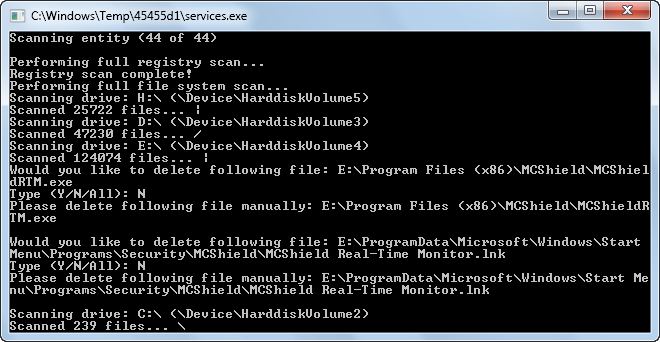 I want to click "Scan" in Eset and for it to do what it's there for: to remove malware. I do appreciate that infected systems may suffer from malfunctioning virus protection but there must be an effective, efficient way of bringing together these fragmented tools back into the core program and be able to run them even if the main product isn't working 100%. Running stand-alone tools may be risky on server production systems and crucial files should always be backed up prior to running them regardless of the vendor. Integrating stand-alone cleaners into regular products would lead to substantially lower efficiency as they could no longer use aggressive heuristics / behavior analysis for safety reasons. ERAR version 1.0.1.1c released. Contains additional fine-tunings based on the feedback received. I just downloaded and ran the latest version. Other than that nothing found. This FP will be fixed in the next version of ERAR. You can restore the quarantined file using ERAR, if necessary. Remember that ERAR is meant to remove actual rogue AV infections if there's a problem cleaning them using ESET's products. It shouldn't be run just out of curiosity as it uses quite aggressive heuristic approach that may result in some false positives.